The cross flute, although not as popular at first as the recorder, has a long history in many cultures. Also called flute traversiere, flute allemande, flute d'Allemagne, traversiere, Flote, Querflote, Flauto, flauto traverso, or traversa, it is first seen in Chinese art in the 9th century BC. Etruscan reliefs (2nd and 3rd centuries B.C.) and a Roman coin (169 B.C.) prove other early cultures had this instrument, although the Greeks evidently did not. After the fall of Rome, this type of flute disappears from European art until the 10th and 11th centuries when it seems to have been introduced to Germany from Byzantium. 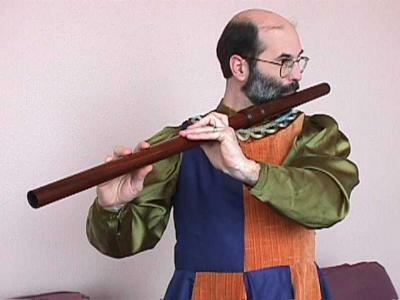 During the 14th century the transverse flute began to appear in non-Germanic Europe. The court of King Alfonso X of Spain used them. French poets and Machaut were spoke of them in the 14th century. Transverse flutes were a novelty in Italy at the time, however, as is pointed out by Sachs in his Real-Lexikon. He mentioned, falauti alemani che si sonano a mezo el flauto, et non in testa, come si fanno li nostri (German flutes that are blown on the side of the instrument and not on the top as ours are). But later, by the beginning of the 16th century, they had established themselves throughout western Europe, showing up in Henry VIII's inventory. In 1554, after hearing chamber music in Metz, Francois de Scepeaux, Sieur de Vielleville and marechal of France couldn't understand why they were called the German flutes, car les francais s'en aydent mieulx et plus musicalement que toute aultre nation; et jamais en Allemagne n'en fust joue a quatre parties, comme il se faict ordinairement en France (because the French play them better and more musically than any other nation; and they are never played in four parts in Germany, as they normally are in France). 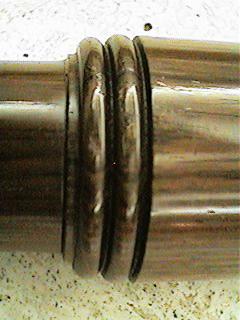 Transverse flutes in the Renaissance had six holes producing a range of two octaves or more. They were were commonly seen in three or four sizes and fingered like recorders except that they were pitched one note higher, not having the bottom little-finger hole. Because the tone of the upper register was not refined and cross-fingerings were necessary for chromatic tones, the flute started to be used less towards the end of the 17th century, not to rebound until it was later adapted with improvements. Musica Antiqua's transverse flutes include a soprano, two altos, two tenors, and a bass, all by Koerber.